Gum Disease: If gum disease is diagnosed early, it can be reversed through treatment. Gum disease is caused by infection in the gum tissue and bone, eventually leading to tooth loss. 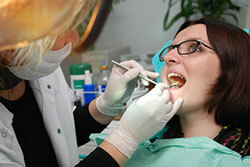 Regular dental cleanings – and check ups – help to prevent gum disease. Oral Cancer: As part of the cleaning, you are also screened for oral cancer, which is curable if diagnosed and treated early. Good Physical Health: Heart attacks and strokes have recently been linked to gum disease, which in turn is often a result of poor oral hygiene. Periodic dental cleanings help to maintain healthy gums and teeth and may reduce the risk of heart disease and stroke. Appearance: Most tobacco, coffee, and tea stains can be removed during cleanings. Your teeth are also polished and shined. The end result is a whiter, brighter smile – and a brighter you! As you can see, having your teeth examined and cleaned on a regular schedule is important for both your health and your appearance. If we haven't seen your smile in while, give us a call. We'd be happy to have you in our office to ensure that your smile is healthy and living up to its full potential!